This rare expression of Napa Valley winemaking is one of only 120 bottles that will ever be made. Think of it as a bit of Napa Valley history in your cellar and celebrated in a glass with friends and family. The fruit for your Premiere Napa Valley wine is from Ridge 4 in the Hess Collection’s Veeder Hills Vineyard, which historically produces their finest Cabernet Sauvignon. Mountain Malbec from young vineyard blocks joins the intense Cabernet Sauvignon in this distinctive blend. This wine is the result of the winemakers at Hess having grown to know Napa Valley’s coolest mountain terrain intimately over the last 35 years. 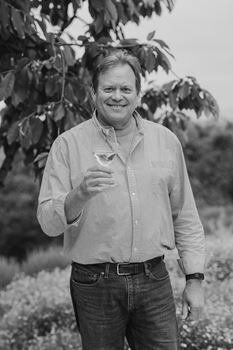 I was named assistant winemaker at Cambria in 1990, then winemaker in 1992, producing Chardonnay and Pinot Noir plus some Syrah. In 1999, Donald Hess was looking for someone to oversee all winemaking for The Hess Collection, and as a student I loved Cabernet, especially from the Napa Valley and it inspired me to pursue winemaking. Now, I'm literally on top of Napa, making mountain Cabernets. Mountain fruit is different from valley floor fruit - and so are the wines. They are structured, complex, rich wines, with distinctive tannins, ageability and concentrated fruit. Education: Enology and viticulture degree from Fresno State University. I have a strong belief in making wine in the vineyard, working each site to absolutely maximize flavors. My goal is to make ripe-fruit-forward California style wines with both power and elegance.